The Austin Marathon – Run It Next Year (If You Haven’t Been Training)! If you’re unfamiliar with the television show How I Met Your Mother, Barney Stinson was an overconfident, boastful character (played by actor Neil Patrick Harris). In one particular episode, his buddy Marshall is training to run the New York City Marathon. Unfortunately, Marshall breaks his toe the day before the marathon. While talking about the situation, Barney questions how hard it could be to run a marathon. After all, he thinks it’s a one-step ordeal. So Marshall and Barney wager $50 that he can run the NYC Marathon the next day without training at all. Since it’s a fictitious television series, the character is able to run all 26.2 miles – although, he does pay for it later (but not by as much as he would in real life). Contrary to Barney’s claim, there’s a lot more to completing a marathon than “you start running.” This means that—unless you’ve been regularly training for an appropriate amount of time (several months) at this point—don’t pull a “Barney” and try to run the Austin Marathon on February 18. Instead, start developing your running program now and make it a goal (if you’re so inclined) to run in it next year. If this is something of interest to you, we have some tips to help so you do so in the safest possible manner! Consult with medical professionals. This holds true when starting any workout program, but make sure you come in and see one of our doctors—and also schedule an appointment with your primary care provider—to make sure you are in condition to start training. Our podiatrists can perform a gait analysis and carefully examine your lower limbs to identify any potential issues. Even better, we might be able to create a plan to address those issues (like with the use of custom orthotics) so you can pursue your running goals. Invest in your running shoes. 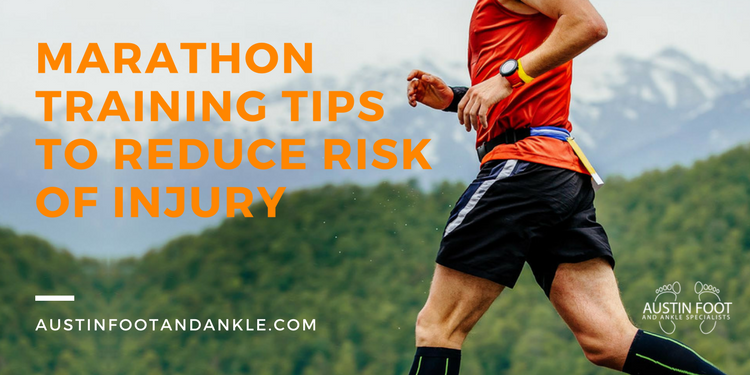 It’s difficult to overstate the importance of this, but when you’re logging lots of miles, you absolutely need proper footwear to prevent overuse injuries like stress fractures, Achilles tendinitis, and plantar fasciitis. The best move you can make with this essential running equipment is to go to a store that caters to runners and enlist the help of a knowledgeable sales associate. Keep in mind that a decent pair of running shoes will run at least a hundred dollars. The money is worth it, though, to ensure that you have shoes that are comfortable, fit properly, and offer adequate support. Ease into it. One of the surest ways to become hurt, burnt out, or both is to try doing too much on the front end. Instead, start at an easy, manageable level and then gradually ramp up your intensity and duration levels. Now, there are “rules” out there—10 % increase per week, 20% of your weekly miles as your long run—but they are best considered to be general guidelines. No two people are the same, and you need to do what fits your body and health status. Cross-train. You can ease some of the workload on your lower limbs by supplementing your running training with cycling and swimming sessions. Additionally, you should start a weightlifting regimen to build up your muscles and improve your range-of-motion so your body will be strong enough to handle the additional force loads you place upon it during training. Warm up and stretch regularly. In addition to keeping your soft tissues strong, you need to make sure they stay limber. This means you should take several minutes before a training session for dynamic stretches and exercises – and then 5 to 10 minutes of static stretching afterward. Don’t push through pain. Long-distance running isn’t particularly comfortable no matter how you do it, but any sharp or chronic pain is a cause for concern and reason to contact our practice and request an appointment. Get enough rest. A big part of training is taking time to rest between workouts. If you work all day, go for a run, catch up on chores around the house, and then crash at bedtime every day, you’re basically asking for problems. Your body needs down time to repair cell damage and get used to the new levels of activity! Need proof? Kenyan runners—world-renowned for their marathon-running talents—are fans of taking naps. Plan your diet. You need healthy eating habits so your body the fuel it needs to be in top shape and perform well. The best practice is to plan ahead. When you come back home following your run, you will likely be quite hungry. Avoid the temptation to binge on a bag of chips by having prepared snacks consisting of a proper balance of protein, carbs, and healthy fats. If you are an absolute beginner—having never followed a regular running program in the past—a tip to help you avoid becoming easily discouraged at the beginning is to start out with a run/walk mix (instead of jumping right into full, all-out running). One way to approach this is to use a 1-minute run/5-minute walk interval and repeat it five times through to provide a solid 30-minute workout. Over the course of the next several weeks, gradually increase the amount of time you run, while decreasing the walking portion of the mix. Before you know it, you’ll be running the full 30 minutes without needing to walk at all. For more information, assistance in creating a running program that will keep your feet and ankles safe, or to request an appointment for treatment – give Austin Foot and Ankle Specialists a call at (512) 328-8900!